Son of Achille, Laverius was raised in a pagan family. Served as a soldier in the imperial Roman army. A convert to Christianity, he began preaching in the streets of Teggiano, Italy. By order of the prefect Agrippa, Laverius was arrested, tortured, put on display for public abuse and ridicule, and ordered to make sacrifice to pagan gods; he refused. He was then thrown to wild animals in the amphitheatre, but instead of attacking him, they knelt in front of him. Laverius was thrown back into this cell, but an angel freed him during the night and ordered him to travel to Grumentum (modern Grumento Nova, Italy). He arrived on 15 August 312 and began immediately to preach and to baptize converts. Agrippa sent soldiers after him. Laverius was captured, flogged, and when he would not stop preaching Christ even while being beaten, he was executed. Martyr. Born to the nobility, member of the Amici family. An excellent student, he was educated at Aquila, Italy. Obtained doctorates in civil law and canon law at Perugia, Italy. Joined the Franciscan Friars Minor on 12 March 1445 in Perugia, taking the name Giovanni Bernardino, and receiving the habit from Saint James of the Marches. Held assorted administrative posts at several Franciscan monasteries in the regions of Umbria and Abruzzi in Italy. Evangelist throughout Italy, Dalmatia and Serigonia. Provincial of his Order in Italy from 1454 to 1460; provincial in Dalmatia and Bosnia from 1464 to 1467; attorney general to the Roman Curia from 1467 to 1469; provincial in Italy from 1472 to 1475. Twice chosen bishop of Aquila, and twice refused the see, citing his inadequacy to the position. Noted historian and ascetical writer, and many of his sermons have survived to today; wrote the first biography of Saint Bernardine of Siena. Benedictine monk. Pilgrim to the Holy Land in 743, and on the way home he stopped in Bavaria - and stayed. Worked with Saint Rupert of Salzburg. 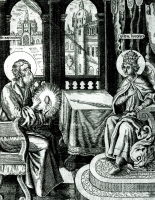 Abbot of Saint Peter's monastery in Salzburg, Austria; one of his monks was Saint Modestus. Bishop of Salzburg in 765, ordained by Duke Odilo. Saint Boniface twice accused him of heresy because of his scientific ideas (including a round earth), but this reflected some friction between the style and people of Roman and Celtic origins, and Virgilius was always cleared of the charges. He rebuilt the cathedral of Salzburg. Sent missionary priests to Carinthia, Austria. With Saint Barlaam, one of the protagonists in a Christianized retelling of the story of Siddhartha Buddha that was popular in the Middle Ages. Many people in India were converted by Thomas the Apostle. Astrologers foretold that the son of King Abenner would one day become a Christian. To prevent this, Abenner began persecuting the Church, and had his son placed under house arrest. In spite of these precautions, Barlaam, a hermit of Senaar, met him, and converted him to the Faith. Abenner tried to pervert Josaphat, but failed, and shared the government with him. Abenner himself later became a Christian, abdicated the throne, and became a hermit. Josaphat governed for a time, then abdicated, too. He travelled to the desert, found Barlaam, and spent his remaining years as a holy hermit. Years after their deaths, the bodies Josaphat and Barlaam were brought to India; their joint grave became renowned by miracles. Migrated to Ireland in 439 with Saint Auxilius and Saint Iserninus to help Saint Patrick evangelize the country; Secundinus preached in the north and east. There are many conflicting documents about him - whether he was a priest or bishop when he arrived, if he had been there before, etc. He apparently served as acting bishop of Armagh, Ireland when Patrick went to Rome. Founded a church and served as first bishop of Dunshaughlin, Meath, Ireland. Wrote the earliest poem of the Irish Church, an alphabetical hymn in honour of Saint Patrick. Raised in a Christian home, in his youth he began to live as a hermit there. Monk at the monastery founded by Saint Honoratius in Lerins, France. Abbot in 426; Saint Sidonius wrote about the revitalization of the monastic life under Maximus' leadership. He became known as a miracle worker and his reputation for wisdom and holiness spread to the point that he fled to live as a forest hermit. Reluctant bishop of Riez, Provence in 434, consecrated by Saint Hilary who had tracked him down at his hermitage. Lived as much as a monk as his vocation as bishop would allow. Attended synods at Riez in 439, Orange in 441, and Arles in 454. One of the most influential bishops in the Gaul of his day. May have studied in both Scotland and Ireland. Priest. Travelling bishop in Ireland. Evangelist in the counties of Perth and Caithness in Scotland. Founded churches dedicated to Saint Patrick at Strageath, Blackford, and Dolpatrick in Perthshire; Wick and Halkirk, in Caithnessshire; and Lungley (now Saint Fergus), in Aberdeenshire. Settled in Glamis in c.710. Attended a synod in Rome, Italy in 721 which condemned sorcery and irregular marriages. Seminarian in the diocese of Wlaoclawek, Poland. Arrested by Nazi officials in 1939 along with his seminary teachers, and lodged in the concentration camp at Dachau, Bavaria, Germany, which had a special section for Catholic clergy. He was offered his freedom if he would renounce his calling to the priesthood; he declined. Martyr. Sailor. Hermit. Benedictine monk and then abbot at the abbey of Saint Gildas of Rhuys, Brittany under Saint Felix. Hermit on Hoëdic Island off the southern coast of Brittany. Military officer and courtier to King Jezdigerd I. During Jezdigerd's persecution of Christians, James apostacized. Following Jezdigerd's death, he was contacted by family members who had never renounced their faith. James experienced a crisis of faith and conscience, and openly expressed his faith to the new king Bahram. He was condemned, tortured and martyred. Sixth-century hermit at the foot of Mount Caro in the area of Blois, France living in a small cell protected from the outside world by thorny brush. Coming to believe that such a complete withdrawal from his fellow man to spend a life in prayer was somewhat selfish, Eusician embarked on a mission of doing good works; known as a healer, especially of children and of throat ailments in particular. Saint Gregory of Tours wrote about his reputation for spiritual wisdom. Convert to Christianity in northern India. Hermit. Brought Saint Josaphat to the faith, and then returned to his life as a cave hermit. Professed religious in the Brothers of the Christian Schools (De La Salle Brothers). Martyred in the Spanish Civil War. Monk at Luxeuil Abbey in Burgundy (in modern France) under the direction of Saint Eustace. Bishop of Noyon-Tournai in 621. 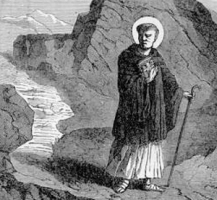 Helped the missionary work of Saint Amandus of Maastricht. Worked to have Saint Omen named bishop of Thérouanne. Hermit at and then near Paris, France. Lived in a walled up cell. Spiritual teacher of Saint Cloud. Born to the nobility. Married to the Duke of Thuringia. Widow. Founded the convent of Altenmünster in Mainz, Germany. Pagan who converted while witnessing the faith of the Martyrs of Sebaste during their persecution; he was martyred with them. Priest at Sebaste, Armenia. Martyred during the persecutions of Diocletian with Saint Hirenachus and seven female companions whose names have not come down to us. Bishop of Aquileia, Italy. Fought for years to eradicate Arianism. Martyr. The monastery of Sahagun, Spain, and the town that grew up around it, were named for him. Monk at Lérins Abbey. Bishop of Carpentras, France. Bishop of Ravenna, Italy in 430. Metropolitan of Aemilia and Flaminia. Once received a vision of an angel who helped him celebrate the Eucharist. Ninth-century bishop of Pavia, Italy for 12 years. Noted for his care for the poor, his insistence on clerical discipline, and his work against vice in the general population of his diocese. Abbot of Monte Cassino Abbey for eleven years. Sixth century founder of the Llanallgo monastery in Anglesey, Wales. A group of Christians martyred together for their faith. Little information has survived except for their names - Auxilius, Basileus and Saturninus.